Kameli Yacalevu was not only a rugby star of his time but what was important is that he became a God fearing man, says a former team-mate and Fly­ing Fijians forwards coach. While delivering a moving eulogy at Nausori Methodist Church yes­terday Reverend Jioji Rinakama said he came to know Yacalevu when he joined the Rewa rugby team. “It was in 1983 when I attended the Davuilevu Theological College where I gave my life to Christ,” he said. “I was still playing rugby and was part of the Rewa team that had the likes of Kameli, Ratu Nemani Ca­vuilati (Tu Ne), Jese Morgan, Mo­sese Tamata and so on. Rev Rinakama said in 1987 he was posted to Nausori Village and there he began to reach out to his former team-mates. Rev Rinakama said from that humble beginning Yacalevu per­severed and held several top posi­tions in the church and until the time of his death he was someone church members especially youths often turn to for encouragement. Yacalevu, a retired school teacher played for Rewa in the country’s provincial rugby union competi­tion and later went on to represent the national rugby team in the late 1970s right to the 1980s. Playing at centre, he toured with the national rugby team to New Zealand, Aus­tralia, United Kingdom and Argen­tina. Yacalevu was appointed as vice-captain and at times captained the national team during overseas tours. His wife Ulamila said she is grate­ful to God for allowing someone like Yacalevu to be her husband. “We had 34 years of marriage life and although we had our ups and downs, I’m always grateful that I had met someone who cared for me right to his last breath,” she said. Veteran Oceania Athletics coach Bob Snow said he was saddened to read about the passing away of Yacalevu. “He was one of my former stu­dents, and good friend, at Niusawa and Lelean. In the 1970s I spent two school holidays at Kameli’s family sugarcane farm in Seaqaqa in the province of Macuata. “The last time I saw him was two years ago when I visited him and his wife, Ulamila, at their home in Nausori. We talked at length about the huge health problems fac­ing former rugby players as they moved from super fitness to an ear­ly death from preventable diseases. Snow said Yacalevu was not only a good rugby player, but he was an excellent athlete, with good speed that was shown to good effect on the rugby field. “He was part of the first ever outer-island team to the Secondary Schools’ Athletics Championships (then called the Juicy Games now known as the Coca-Cola Games) in 1975,” he added. 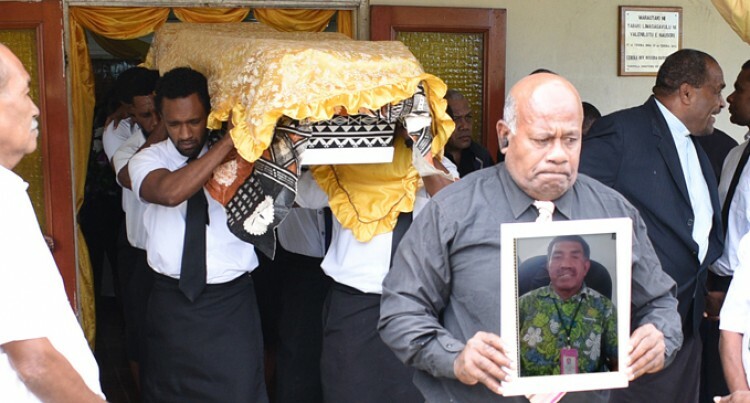 Yacalevu was buried at the Nau­sori Village cemetery and among those paying their last respects were former Flying Fijians legend Ratu Ilaitia Tuisese along with star backs Seremaia Bai and Iosefo Bele.